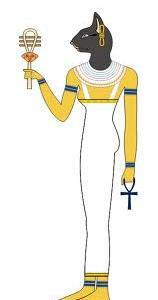 Bastet the Egyptian Cat Goddess was not the goddess of cats but a woman/cat goddess who protected the Pharaohs. She is usually depicted with a multicoloured collar. 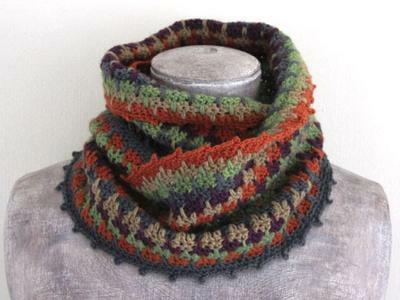 Marylene Lynx has taken 5 autumn colours and with her magic crochet hook conjured up such a circular collar or cowl for us to wrap ourselves in this autumn and for many autumns to come. 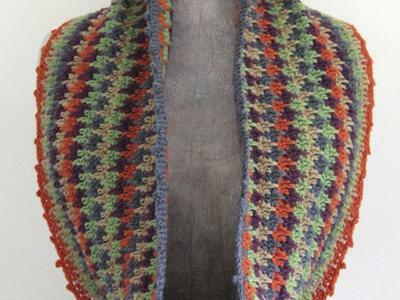 The Bastet Cowl is crocheted in hounds tooth stitch with a picot edging. It's super easy and quick to make and can be worn in several different ways such as short or double loop, close around your neck or longer like an infinity scarf. But you can also wear it wrapped around your head as a headband. I really enjoyed dyeing these 5 shades to match what Marylene had in mind. This is not always easy when you live a country apart and we were delighted when lots of folk joined in on the discussion on the Renaissance Dyeing Facebook page. There are many opinions about Facebook but it can of course be a way to do the social networking it claims is possible. 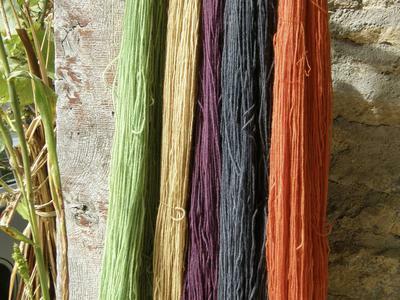 So do join our Facebook page to keep up with those colourful moments that can happen in the life of a natural dyer.